There are many types of anchorage systems available, ranging from custom-designed devices for specific projects to standard, commercial options. Pictured is a combination gravity and lateral-load anchorage using welded stainless steel anchors. The anchor system connects the stone unit to the building’s framing, and thus is the next critical piece of the load path. Often the anchor consists of multiple components to fasten the stone panel to the frame. Improperly designed, manufactured, or installed anchor systems are common failure points, often resulting in fractured stone around the anchor prep cut. Anchors have three key load transition points: the junction between the stone and the anchor, the anchor itself, and the physical connection between the anchor and the building frame. Anchors can be attached to the stone panel in a variety of ways, depending on the project and stone type. A “prep cut,” or kerf, is machined into the stone panel. The most common types are a hole, a “plunge cut” kerf, a kerf of a determined distance, and a continuous kerf. 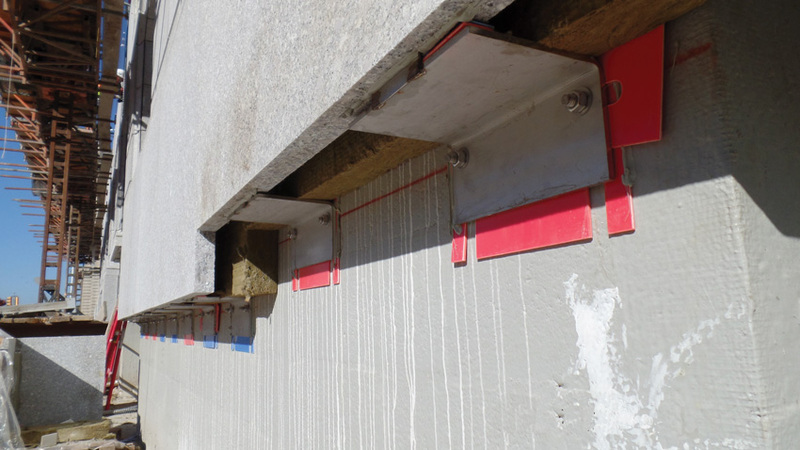 In order to protect against potential failure, installers should make sure that the anchor tab is properly sized and, if possible, longer than needed to improve the strength of the connection with the stone panel. Some situations will call for one type of anchor, while others require another, depending on the load path. For example, the anchorage needs of a load-bearing clip (or shelf) angle, where gravity is the primary load force, will be very different from a situation where positive or negative wind load (plus gravity) affect the panel. Anchors can be connected to the building frame with a variety of techniques, depending on the material to which they are being anchored. Expansion anchors, for example, can be installed into concrete, and other anchors may be welded to hardware embedded in the concrete. If the frame is steel, anchors may be welded or bolted. Lighter-gauge metal frames may have self-drilling or self-threading fasteners installed as anchors. This connection is the last piece of the load path for which stone installers are usually responsible. One of the biggest mistakes that architects may make when considering natural stone cladding is to fail to consult cladding engineers or facade consultants at the start of the project. A cladding engineer and/or cladding architect can review the architectural details of the project and help ensure that the proposed cladding and anchorage systems are compatible both with each other as well as with the rest of the project specifications. 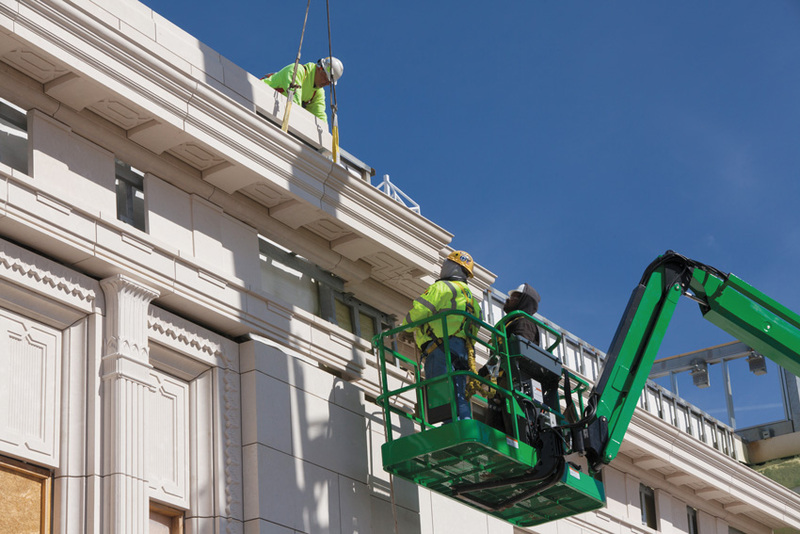 Early communication with a facade consultant can help avoid any problems further along in the project and ensure successful installation. Structural engineers will almost certainly be involved as engineer of record (EOR) to assess the project for potential seismic and wind loads; consequently, they will be interested in the cladding anchorage system and how it impacts the structural load. In many cases, the EOR may not be familiar with the cladding system or how it impacts the structural load, and so early communication with a facade consultant can help avoid any problems further along in the project. 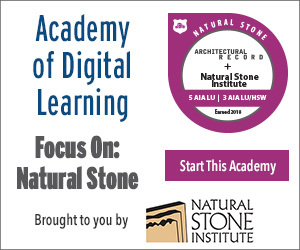 Whenever possible, architects should hire Marble Institute of America (MIA) accredited stone installers to consult on the project (and to perform the installation), and they should be responsible for designating the anchorage system. Most installers work with many different systems and different stones, and thus can help determine the most appropriate system for the project. Good practice includes providing performance specifications at the start of the project, making sure that shop drawings and anchorage calculations are always required; the specs can help the rest of the team be more confident in the anchorage system. The main purpose of anchorage systems is to attach the stone to the frame. To be successful, such systems must resist both lateral and gravity loads. Consequently, the best anchors generally are the simplest and designed with the fewest components, and thus the fewest potential failure points. Anchors are also carefully designed to prevent galvanic corrosion, both of which can cause the anchors to fail years after they have been installed. Clip or shelf angle anchors work by supporting the stone’s dead load via short, thick L-shaped metal clips. 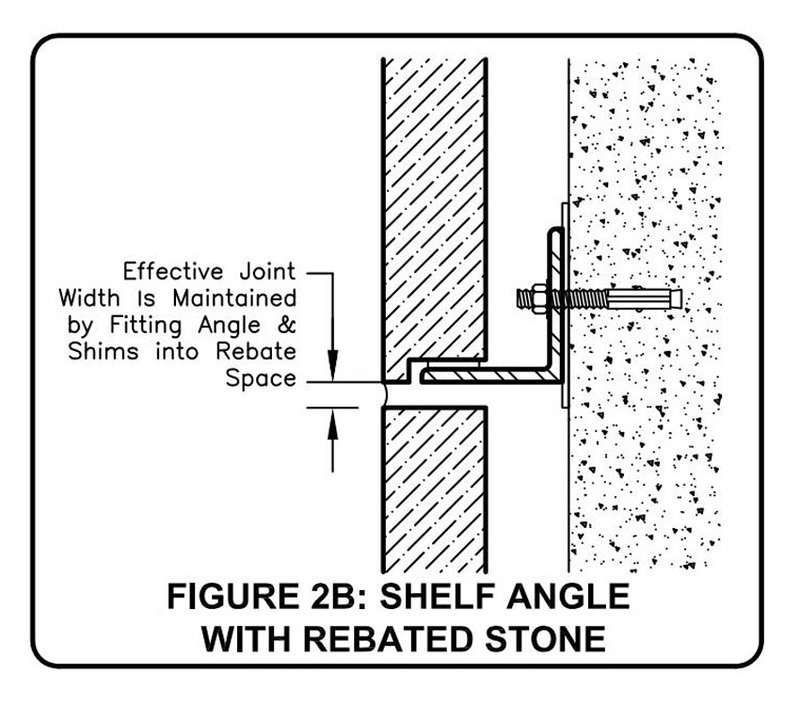 Clip or shelf angle anchors work by supporting the stone’s dead load via short, thick L-shaped metal clips. The vertical leg of the section is anchored into the building frame, and the horizontal leg supports the stone cladding. Shelf angles are usually made of mild steel with corrosion-resistant coatings. While their primary purpose is to support against gravity, they can be modified to address multidirectional loads by adding a small clip that penetrates the kerf in the stone. If this method is used, the clips are usually stainless steel or other metals with appropriate separators. With heavier stone, an additional rebate or a kerf cut that is sawn to form a slot may be cut into the bottom edge of the stone to provide full movement function of the joint.